Obama, who once spoke so glowingly of the value of whistleblowers and a free press in a democracy, has turned out to be the most secretive president in modern times. His war on journalists and whistleblowers is an all-out campaign against freedom of information. Obama spoke about his desire for transparency and its importance in a democracy early on, but his has been the most secretive presidency in recent times. It has classified many more documents than Bush's adminsistration has -- so many, that everything is a secret now, and revealing any information is to breach "security." To heighten the effect, four million people have security clearances. Something has to give. 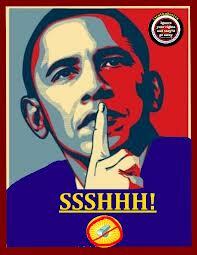 The Obama administration is much more tight lipped and hostile to the press than Bush's was. Most notably of all, it has evoked the 1917 World War I Espionage Act to to prosecute Americans twice as often as all other previous American administrations put together. In general, the mainstream media has been eager to go along, demonizing Edward Snowden and virtually ignoring the burying of Private Bradley Manning, who was held in solitary confinement for three years without trial, a hunk of it naked. A New Yorker writer in a blog Jeffrey Toobin, was quick to get the Snowded-smearing bandwagon rolling, calling him a "grandiose narcissist." Even pro-left Nation film critic Stuart Klawans published a review in the New York Times dismissing Robert Greenwald's documentary, War on Whistleblowers, as a "Bar Mitzvah video"; others too have criticized this film as not fully sounding the alarm (because under an hour long), slipshod, or too sensationalist. But Greenwald did sound the alarm. So have many others. But what Greenwald does is merely provide a quick outline of whistleblowers and show how they are being prosecuted. We need such outlines, because there are going to be more Snowdens and Mannings and more prosecutions. Whistleblowers are being charged with espionage over and over nowadays. But this is propaganda and intimidation. The important thing is to see the differences between a spy and a whistleblower. A spy traditionally works for a foreign power; he or she gathers secrets from another country and is paid for it. None of the American whistleblowers have done that. A spy steals secrets. The US government, the NSA particularly, does that all the time, but does not sell them; it keeps them for itself, enormous volumes of them it turns out, with minimal positive results but an invasion of everyone's privacy. Whistleblowers customarily have acquired the information they reveal legitimately, in the course of their work. 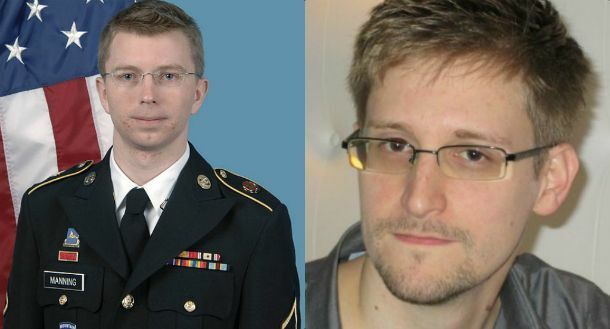 Manning and Snowden revealed only information they were already given access to in their jobs. Whistleblowers usually are troubled by things they find are going on -- that their government is doing in our name. They inform their superiors of their concerns. They are brushed off, and when they, repeatedly, try to go through channels, they must choose either to slink away and say nothing, or to go public. They do not give their information to "the enemy" -- unless you, like, apparently, the Obama administration, regard the press in that light -- but to the public. The effort to demonize Julian Assange is part and parcel of the effort to demonize whistleblowers, only the method has differed. He has been defamed, threatened with charges of sexual misconduct in Sweden, and accused of being a sensationalist, not a journalist. The government doesn't know how to regard Assange, because he is a new animal, a hactivist turned conduit for whistleblowers. This is the digital age. This means that vast amounts of documents can be easily accessed and conveyed, as Manning did to Wikileaks, which acted as a conduit to the press. 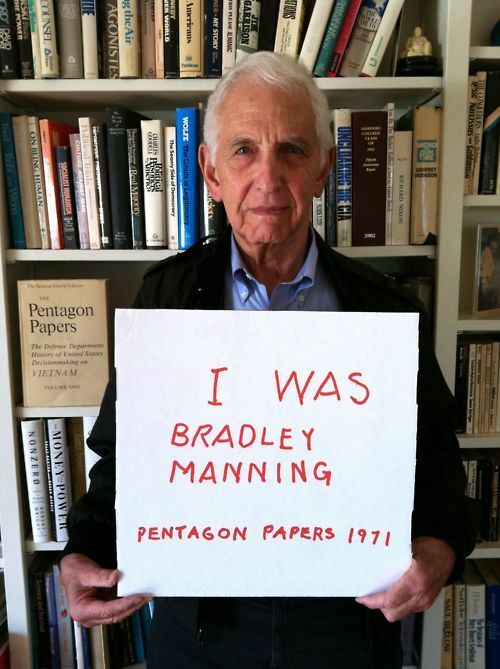 No need for the hours of furtive photocopying that Daniel Ellsberg had to do in the Pentagon Papers days, and you can't stop the press before printing: it's out and all over the Internet the instant the decision is made to reveal it. If you want to claim that Assange, Snowden, and Manning are traitors and spies, you have to ask yourself how come the information they provided was immediately published wholesale by the New York Times, The Guardian, Der Spiegel, and Le Monde, the most eminent journals of four of the West's leading countries. We remember that in the Pentagon Papers case Nixon at first tried to indict the New York Times, for publishing Ellsberg's revelations, but that was dropped. This time Obama didn't bother. He just went for little Bradley Manning, a sitting duck, so to speak, since he was serving in the military and could be manhandled, so they thought, in secret, and tried without a jury by a military court where the press had poor access. But how Manning has been treated is no secret. The more you try to hide, the more will come out: the more secrets you create, the more will be revealed. James Goodale on Democracy Now! 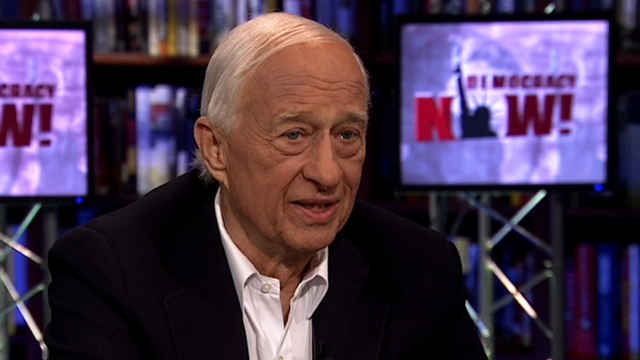 !It is interesting to see what James Goodale, a distinguished First Amendment lawyer and the New York Times' attorney in the Pentagon Papers case, had to say when interviewed on Democracy Now! about the Obama administration. He said that Obama is "behind Nixon and ahead of Bush II," but "close to Nixon now," and added that if Obama prosecutes Julian Assange, he will "surpass Nixon." It appears that the Obama administration has an indictment of Assange ready on file (for conspiracy, according to Goodale) and is poised to use it. Goodale discussed the revelations of the administration's surveillance of 100 AP reporters and indictment of six -- showing that Obama's unprecedented war on whistleblowers is paralleled by an even more wholesale war on journalism in America. David Cay Johnston on Democracy Now! 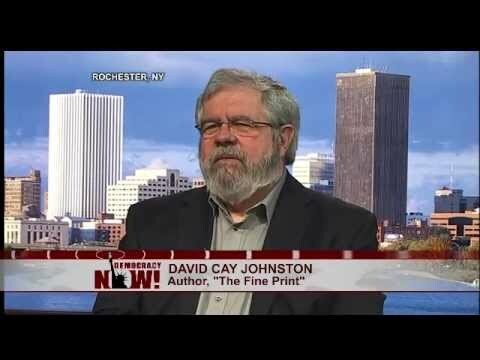 In this light David Cay Johnston, a Pulitzer Prize-winning journalist and president of Investigative Reporters and Editors, was also interviewed on Democracy Now! about the administration's war on the AP. He described how Obama "campaigned on transparency," yet his White House from the first was hostile to the press. People would refuse to give information, say "What do you want that for?," refuse to say who they were, and even hang up on him. This is a secretive administration and it makes no bones about it. Johnston said "I rate them worse than the Bush administration." This is what we're dealing with. Think about this when you hear Bradley Manning and Edward Snowden, whose revelations have been an enormous influence in the world already, called traitors and spies. Snowden is demonized and sought for prosecution by the US, yet in Congress a big investigation is under way spurred by his revelations. This is the same kind of disconnect as the prosecution of Manning, while his revelations, published in the New York Times, are referenced constantly, part of common knowledge. This makes no sense. Whistleblowers break rules to serve a higher cause, often at great cost to themselves. They deserve protection, not prosecution. This presidency's mania for secrecy poses grave dangers to journalism. Article on The Whistleblower, "180° Flip Flop on Espionage Act Now That Journalists are in Cross-hairs"
New Yorker blog, "Demonizing Edward Snowden"
Chris Knipp went to a one-room schoolhouse in Williamsburg, Virginia, where his father taught Shakespeare and played the horses. Knipp has been a soldier, Arabist, teacher, and long-distance runner. He grew up in Baltimore and has lived in New York, Cairo, Rabat, and San Francisco. The teaching and friendship of West Coast beat art legend Jay De Feo brought him to an art career. He has become known for his chine collé etchings, which are in collections throughout the U.S. and abroad. In his present imagery he is influenced by the Russian avant-garde. He admires Matisse and he likes to listen to nineteenth-century keyboard music and Bach, jazz, and the songs of Umm Kalsoum. He now spends a lot of his time at film festivals and screenings and writing movie reviews.